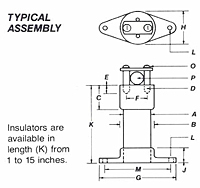 When heavy loads and high voltages are present in stationary applications, LSP Heavy Duty Standoffs are required. They provide an effective means of supporting large electrical components such as bussbars or capacitors. Only a few of the more popular sizes are shown in this catalog. When hostile environments are present, convolutions or petticoats can be provided on the glazed surface of the insulator. White glaze is standard on ail exposed ceramic parts, with brown glaze available optionally. Permanent marking under the glaze may also be used. CAPS: Metal end caps used to provide attachment to your devices are available plated or unplated in brass, aluminum, or galvanized iron and are permanently cemented to the ceramic insulator. Threaded holes in any configuration can be produced. BASES: Two base styles are used for Heavy Duty Standoffs-Style 1 is an elliptical shape while Style 2 is round. Style 2 bases are used on large diameter standoffs to support heavy loads. Materials are the same as for the caps. ACCESSORIES: When high peak voltages are present, corona shields may be used on the top cap. These are available for most standoff sizes. Cable clamps may also be requested for the top cap. NOTE: Please send a sketch or description of your insulating device so that we may work with you to provide an insulator which will best meet your needs. 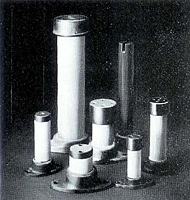 Insulators up to six inches in diameter can be produced.